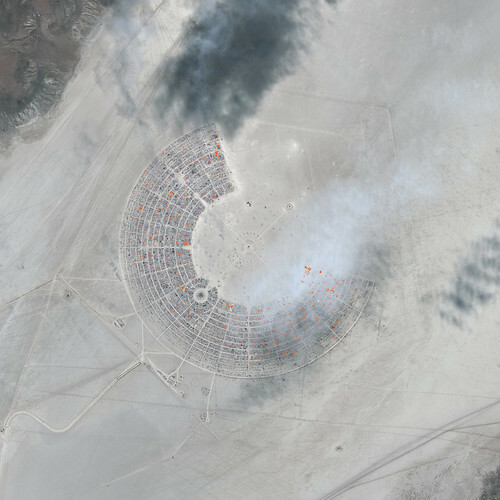 GeoEye‘s annual high resolution picture of Burning Man from the sky, taken on Friday 31st August 2012. Note: I counted this map twice and took the lower count. As far as i can see there were 739 hexayurt shaped structures (with the familiar 3point shine/shade/shadow on the roof) on the playa this year. There are quite a few smaller rectangular shaped structures that are next to / or near hexayurt encampments which may be H2 or H4’s. These were not included in the count as i was uncomfortable making the call, as they may be just shiny tents. I used the 30pt star stamp tool and marked each structure on the map in a new layer on the image. Unlike last year, where i went around the camp in concentric circles. this year i split the camp into the 16 quadrants of the camp and worked the count from the centre outwards in each one. After that i did go round the camp in concentric circles to make sure i hadn’t missed any on the previous passes. 739 hexayurts!!?? Wo0t this is way more than last year, and considering the official population of Black Rock city this year was 1578 people lower this year than last year – which if you do the maths is a 54% increase (by population) on last year. I feel this is a big win for the project – and quite likely the biggest single deployment of open hardware to date? Yurts this year were colored, i saw some pink and purple ones!! Lastly: Considering it was only 9 years ago that the first hexayurt was built on the playa and the only real investment that has ever been made in the project has been a web domain. i think EVERYONE that has ever built, designed, or contributed their time in anyway to the hexayurt project should feel tremendously proud. Apart from seeing a few tri and quad domes, i *think* i might have seen a hexaplex which has never been built before, it looks like the same material – i included it in the count both times – but in my mind it’s definitely in dispute. so i’m mentioning it. There are more than one group of people standing in a heart shape – did they know the satellite was passing over? On the the bottom right of the camp, there is a huge red arrow. Informal tracks, walkways, and roundabouts that run through and across the camps that break with and stand out from the geometry/layout of the camp, but can only be seen on close observation of the camp. Maybe someone who reads this could maybe fly a homemade drone and get a HUGE detailed image next year?